Julton has been in the university since he was 16.... now hes 24... and hes still not finished! 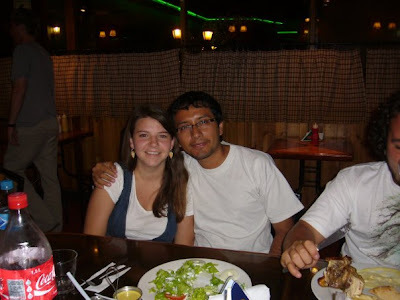 getting a degree in peru is quite a complicated process... the year before last he spent the year writing his thesis, which he and his partner presented to a board of doctors... and they passed! then... for one year he was in his internship (last year) which means that he spent every waking and non waking minute in the hospital working. he barely slept. and i barely saw him conscious. he finished along with the new year... and this year is starting his work at the clinic. Now we just have to wait for him to get his title... then to get his colegiatura... which is a special number that he can put on his special stamp to prove his license to put on all those prescriptions that hes going to be writing. I'm very proud of him :) God has been blessing us so much! We both have jobs, we have our apartment, and we will be married in a month!!! straight up, flat out, tired. you see, since september ive been making up my own schedule. it was going pretty well. if i didnt want to teach a class early in the morning i didnt have too, i could say no. i could say lets do 10? usually it wasnt a problem. oh how those sweet sweet days have passed. and been replaced by barney. the green and purple kind. im just kidding its not that bad, although barney is involved sometimes. this past 15th i started my new job at a jardin. false: i was looking forward to changing my comfortable routine for the lifestyle of a more formal profession involving getting up at an hour i didnt even get up to in college. or jam packing myself sardine style into a couple micros to get to a place close enough to walk to work. true: i like my job. and i thank God for it. the past couple of weeks have been very good to me in growing ways. of course i had the nervous eyes and the tentative ear and eager smile of anyone starting a new job in a different language. but im making it. im trying really hard not to be that girl that just stares at everyone because they dont really know what to say or how to fit in. okay - im going to try really hard. i havent been doing the best job. -working where spanish is the language and english are the words everyone knows a few of. granted i live in peru, that doesnt mean i spend all of my time in spanish conversations. most if not all of my friends know a little english and usually our conversations are very mixed. its that way in the jardin too more or less, the teachers are learning english... but... when you are sitting in a room full of 15+ women its safe to say that gossip and work and day to day shtuff gets done in native tongue. i'm pretty content with how things have been going so far. i sat through an hour long meeting without having any trouble or loosing track. and that was at the end of the day. safe to say, ive been greatful for the opportunity to practice spanish. -preparing to teach 4 and 5 year olds. - working closely with two different guys from two different countries. although the rest of the teachers are peruvian women, the english "department" consists of a peruvian guy myself and a guy from the netherlands. its been interesting and funny and stressing for us to all get to know each other and work together. -not eating until 3 pm. pucha.... and i dont usually eat breakfast so you know whos stomach starts howling at 11:30. -getting up early... riding buses at the 'rush hour' for buses. clinging to whatevers available so not to fall out the bus. and holding your breath as the bus zooms through the street, the pavement flying past you as you nervously cling to the handlebar knowing that theres only the experienced money taker holding you into your spot in the door. well, all of these things aside... i like my job. and although i wouldnt admit it when i wake up i like that i have some more consistency to my mornings. sometimes i dont even mind the cold showers. one of the best parts has been the culture changes i get to see and notice. im used to them for the most part but... when the seamstress for the uniforms (whom we have fitting our uniforms just right ... culture difference: if your uniform is too big it gets changed... presentation is key) comes into the room and asks if anyone doesnt want the shorts taken in at the knee because they have fat thighs. "because for example 'maria' (seamstress points to maria) has come to me and would not like to have the knees taken in... because she has fat thighs, does anyone else have fat thighs??" but in conclusion: i do like my job. im grateful. im looking forward to getting to know the other teachers, and im excited for the students to come. im also looking forward to moving into my new apartment this weekend! julton and i are signing our contract tomorrow and i will move in! no more micros to work, its close enough to walk! we are getting married a month from tomorrow!!!! the street vendors start selling umbrellas... the kids stop throwing water balloons at each other and passing strangers...your feet get DIRTY...and the streets look like canals. This picture actually makes things look like they should when things have been rained on, all new and clean and fresh. when in actuality... its pretty disgusting to go out in. I usually love the rain and had been telling julton that I had been missing it. and i said i take that back. because trujillo is a dirty city... and i do mean dirt dirty. take a walk or a few steps outside and come back with your feet covered in layers of grossness. and there arent any drainage spots in the roads... so all the water just sits until the sun comes back out to dry it up.and when the sun comes back, boy does it come back with a vengeance. go out for a walk in the rain and come back really dirty, go out for a walk in the sun the day after and come back with scorched skin. it also means that water starts to come into our not-ready-for-rain rooves. oops!